Save 30% off Pureology. Discount has been applied to RRP. Offer is valid for a limited time only. 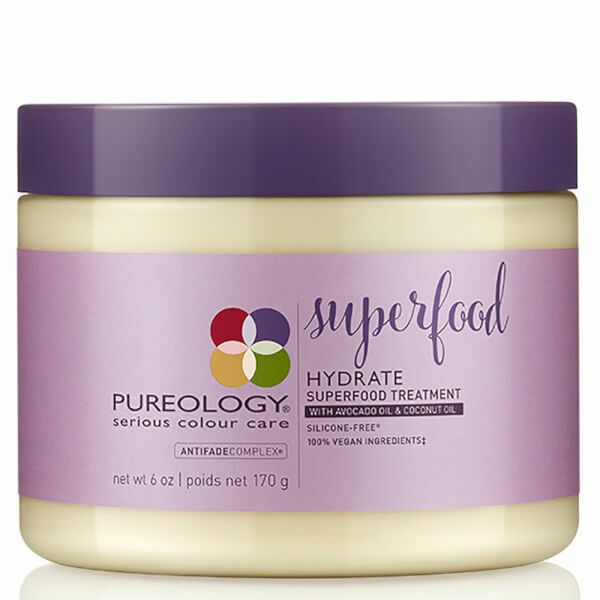 Treat dull, tired locks to the Pureology Hydrate Superfood Treatment; an intense formula that utilises powerful superfoods to fortify and invigorate strands from root to tip. Packed with essential nutrients, proteins and vitamins, its revitalising blend of Coconut and Avocado Oils work to replenish and hydrate dry hair, as they calm and moisturise the scalp for long-lasting comfort. Moisturises and softens dry, thirsty hair to leave it more manageable. Pureology formulas are highly concentrated. You only need to use a ten pence coin amount for each wash. Rub the product in your hands and then apply to wet hair focusing on ends and mid-lengths. Leave on for 2 - 5 minutes. Rinse. Aqua / Water, Cetearyl Alcohol, Glycine Soja Oil / Soybean Oil, Behentrimonium Chloride, Parfum / Fragrance, Isopropyl Alcohol, Glycerin, Phenoxyethanol, Tocopheryl Acetate, Cocos Nucifera Oil / Coconut Oil, Persea Gratissima Oil / Avocado Oil, Ethylhexyl Methoxycinnamate, Butylene Glycol, Bht, Chlorhexidine Digluconate, Helianthus Annuus Seed Extract / Sunflower Seed Extract, Limonene, Citric Acid, Coumarin, Ci 19140 / Yellow 5, Ci 14700 / Red 4, Melanin, Tocopherol, Pentylene Glycol, Helianthus Annuus Seed Oil / Sunflower Seed Oil, Rosmarinus Officinalis Leaf Extract / Rosemary Leaf Extract, Ethylhexylglycerin.